It’s a surprisingly cold morning in June 2002. The iron clad wooden doors of the Booth Museum of Natural History in Brighton haven’t been open long. A dishevelled figure is sheltering in the lobby beside the large stuffed bear that watches over every visitor. As I pass through on the way to the shed installation where I’m working as writer in residence, the figure leans towards me from the shadows and, Ancient Mariner style, ‘almost holds me with a skinny hand’. “Are you Shedman?” he asks. A few months earlier I decided to apply for an Arts Council Funded competition to be ‘a writer in residence in a place of architectural interest.’ After considering the West Pier and the Pavilion, I remembered the Booth, the quaint natural history museum on the way out of Brighton toward’s Devil’s Dyke. I arranged to see John Cooper, the Curator, who took me on a guided tour and told me a little of its history. So that’s exactly what I did. But the thing about Shedman is, he’s not what he seems. A lot of people think Shedman is just about sheds, the little wooden building on the edge of the garden. But I’m a poet, fascinated by language, so Shedman is as much about the word ‘shed’ and all its different meanings. ‘Shed’ construction is the dominant form of modern architecture in the shedlands on the periphery of cities. The ‘shedding’ of blood or light, tears or joy is the stuff of poetry. And there are connections with natural history – the ‘sheds’ of insects and animals (skins, antlers and shells). The Shedman project is a unique mixture of language, architecture and nature – on that periphery where words meet the built environment and countryside, the tame and the wild. A typical shed can be the gateway to memories, a store of secrets and a dumping ground. It can be an observatory on nature. It’s a place halfway between home and the wilderness, between order and chaos, between the artificial and the natural. A shed is down to earth and unpretentious. Sheds are very close to British hearts and we enjoy remembering and celebrating them. They’re so like us – transient and fragile. Whatever the reason for our fascination with sheds, they exert a magnetic attraction on anyone who passes by. A shed is both a container and a threshold. It’s a space of creative inspiration and endeavour, as it has been for dozens of writers, composers and artists from Mozart to Dylan Thomas, and for generations of model makers, woodworkers and engineers. But it can also be a zone of adventure and experiment, where people first try smoking, drinking alcohol or taking drugs. For some couples in the first half of the twentieth century a shed was where they first tasted sexual pleasure. But it can also be a darker and more dangerous place, where the Unabomber concocted his explosives, bodies are hidden in freezers, trophies kept. Whatever the reason for our fascination with sheds, they exert a magnetic attraction on anyone who passes by. When the shed door is open we’re all deeply curious to look inside. My shed is very accessible. Anyone can come in to tell me their shed stories, to bring anecdotes and poems, pictures and photos, recollections and fantasies. A shed is a great way of engaging people with poetry, creative writing and the natural world in an enjoyable and intriguing way. I’m very grateful to my wife, as Shedman led me to a new career now in its twelfth year. Shedman has taken me on adventures far and near – to run writing workshops in schools and colleges, hospitals and galleries, to attend festivals at home and abroad, to work on special commissions of new work, and to meet hundreds of fascinating people who have told me their shed stories. There was the man who set fire to the family shed when a boy – and to his mother as she tried to put the fire out! There was the elderly aristocratic gentleman who guiltily confessed to stealing a dinky toy from another boy’s shed over seventy years ago. There’s was the young man who remembered the munitions his friend’s granddad kept in a shed that eventually blew up. People have told me dozens of stories about the wildlife to be found in or near sheds. Then there was the man who knew the best shed in the world. 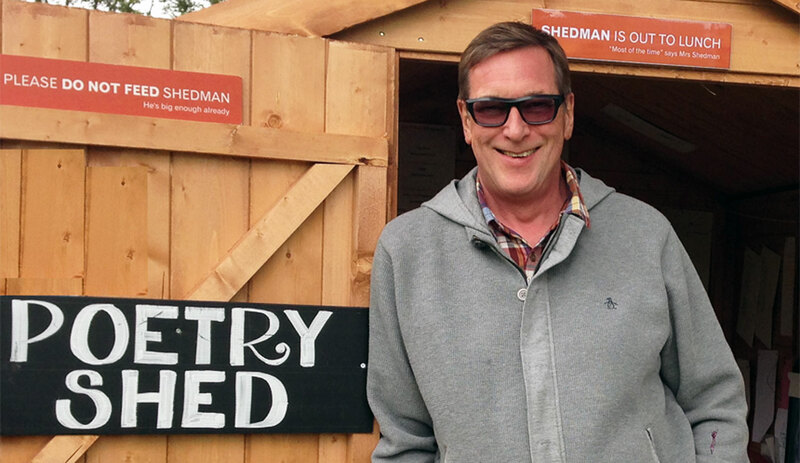 You can meet Shedman at Ledbury Poetry Festival 3-12 July 2015. You can find him online at www.shedman.net or on Twitter @Shedman.